sirwm and ChopTop like this. What's worse than a bad review.....no review at all. I'm sorry, but whoever wrote that piece was just making things up and connecting them in a way that wasn't the truth of the way things were. If you wanted a Z0K equipped car, you had to take it with the extra spring perches because that was the only way it could make it all the way through the Wilmington production process. It was also mandate by the trucks that are/were used to deliver cars to the dealerships. Most of the serious racing crowd was going to pull those pieces while race preparing those cars anyway, so no big deal. It's just silly fiddle-faddle thrown together to create an article. There is hardly any basis for this in real life. Last edited by DaveOC; 04-12-2019 at 09:45 AM. Nice historical piece BUT the negative tone...ouch and why? I will never understand the bashing over parts sharing. This has been a common practice at GM and probably all other mass producers since the beginning of the automobile. (This was certainly true with my sports cars of the 50's and 60's) Why is that such an issue? Part of the attractiveness of the Solstice for many was it's low price point. Anyone can build a unique sports car if price isn't an issue. As for the ZOK, they could have sold the option package as dealer installed and just thrown it in the trunk...another common practice in the high performance car market some years ago. Hagerty should know better than to print this stuff. I don't know the author but maybe he doesn't have the historical perspective...or just likes to complain. Thanks for sharing RedOne. I think it is an interesting concept. People pay to get the Z0K suspension and then have to pay to get the Z0K suspension. I'll reply after a bit of research, but the only people "buying" the Z0K suspension were the racers, because so much content was removed from the car, or otherwise unavailable, when the Z0K option was chosen. Added on edit: The Z0K included Anti-Lock brakes, Limited Slip differential, and the FE3(GXP) suspension, and higher rate sway bars. Required cloth seats and NO OTHER OPTIONS on the car, so no power windows, no a/c, no radio, no cruise control, steering wheel with no controls, must have painted wheels, no floor mats, no on-star, nothing else. In other words, they were strippers. The "go faster" parts were available from GMPP and could be added to any Solstice or Sky if you wanted it to handle marginally better than stock. Again, most serious racers removed the springs and shocks anyway in order to install racing springs and shocks. Last edited by DaveOC; 04-12-2019 at 10:16 AM. Uhh, no. The Z0K suspension and the ride height are two completely independent things. The Z0K cost was for the stiffer suspension. If you also want to lower your car, that is a separate matter and you are going to have to pay a little bit more for it. The fact that they built the capability in is actually a benefit, since the cost to lower it this way is significantly less than it would have been to buy new springs and then have to do the full disassembly, and you still would have to do a realignment. As far as that goes, anyone going to that extent should be getting their own more aggressive alignment done anyway. Would everyone have been happier if the lowering provision wasn't built in? Unless you are spending most or all of your time on a track, a lowered Kappa is nearly un-driveable. I know people do it, but I already have more under-nose damage than I like from driveways and speed bumps, so a lowered car to me would have been undesirable even if I wanted the stiffer suspension. 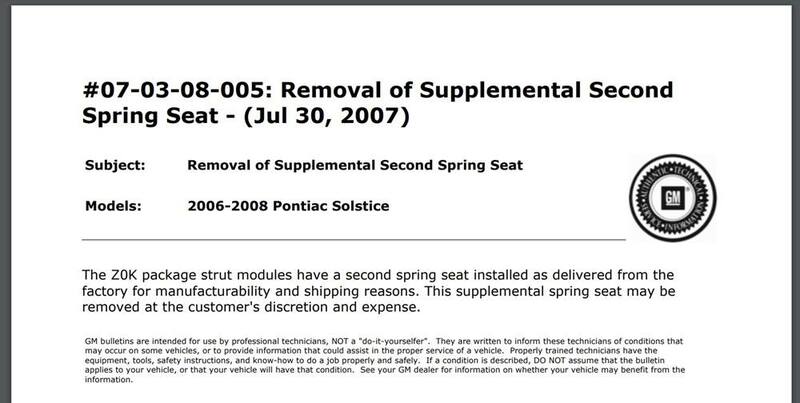 If GM made a mistake in this it was if they did not list a cost up front: $2000 for a stiffer suspension, and $1000 to have the car lowered. Seriously? People do that on the internet? When you ordered a Z0K package, you got it, the whole suspension, plus a half inch spacer on each corner. As John said, ride height is a separate issue. Last edited by DaveOC; 04-12-2019 at 10:27 AM. As a racer who FINALLY acquired all the GXP Z0K suspension parts and installed them.... (rear brace, both sway bars and the stiffened, LOWERED springs) I did a lot of research on the Z0K package. PART of the design/go faster part involved lowering the car. The issue as noted was once at the height the kit was designed to be, the car was too low to go through the production line, thus the addition of another spring perch to raise the car. ALSO as noted earlier.. they assumed the "racer types" would remove the shocks anyway as they were equipped with the same shocks as the GXP model. And YES.. my car really is uncomfortably low.., I will sometimes scrape road undulations on my race tires... but they are a bit shorter than stock too. Didn't the forum has post from members not being told about the extra Z0K suspension spacers until they read about it on the forum or found out about them by themselves. Point being didn't some dealership ignored the ZOK bulletin and failed to notify Z0K customers? There may have been complaints, but the threads I have found from those days didn't have any. Most of them talked about the need to make pretty radical camber adjustments after lowering, and every one that I read a post from had already planned to do a realignment to race specs anyway. Maybe someone with more interest and more spare time cam do a more exhaustive search and find them. In 2007, there were only 18 Z0K's made, I don't know about other years but not many so finding complaints may be hard with so few actual owners. When I got mine which had 10K miles at the time, it still had the spacers as many I'm sure didn't know they should be removed. Couple hours later, spacers removed by myself, something any autocrosser or racer could do. I'm glad GM offered the option and didn't just have part you could buy after the fact because then car would not have been legal for stock autocross classes as rules require the parts be available to be ordered and installed in the car (no trunk kits) to be legal (with a few exceptions). The car is faster in an autocross than the Miata except maybe the newest ND and, yes, is low to the ground with no body roll. Good info! Question how did you find the extra spacer? Was it as obvious as looking at the shocks & springs? I didn't read any negative in this at all. just some good info. gm could of just put a rubber spacer or twist in spacer that could be removed fast at the dealer as part of the set up &delivery process. I've assembled lotsa vehicles out of the "crate" or off the hauler, there is always lotsa stuff that has to be done.some more some less.some a effining pile to be done on"new"model as is first year or major production change that wasent going as well as it should. But sticking a spacer in that had to have a realigine and removal isan't part of that ,I think that was a gm remove it if you want it lower thing.as not everybody wants one lower but they still want the suspension package. if it was just a didnt want to cover the cost of realine they would of aligined it so it was right when the spacers were in and then a quick removal.and then charge to realine and put them back for the guy that is pissed because his car drags on a ant turd. and parts sharing....everything has parts sharing..even people.if you hadent told me my steering wheel came from a envoy or whatever it came from I would of thought it came off a vette...or possiably a viper.